2 Commercial Real Estate & Properties in Gordon are listed in 2 categories. We have 1 OfficesSale and 1 Retail ShopsSale . 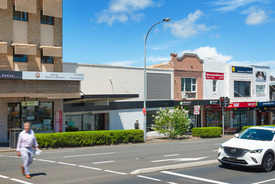 Shead Property are delighted to present 791 Pacific Highway Gordon for sale via private treaty, a fantastic freehold property situated within the coveted Gordon retail precinct. A truly unique property and a chance to own one of the widest and largest single retail shops along the Pacific Highway Gordon corridor. Strategically located diagonally opposite the Gordon Centre, the property is also easily accessed via a busy and popular rear lane which adjoins a council public car park and boasts on site parking for 4 cars. Being offered with vacant possession for the first time in 25 years, this is an opportunity to cement your stake in the current and future redevelopment upside of Gordon. • Prime Gordon Location • Total Land Area 373.5 sqm • Double Frontage to Pacific Highway & Wade Lane • Development Upside with 3:1 FSR & 20.5m Max Height • Zoning B2 Local Centre • Rear Access with Onsite Parking for 4 Cars • Offered with Vacant Possession For further information please contact Anthony Parisi 0415 902 329 or Bill Geroulis 0413 100 200 Disclaimer: All data is provided for information purposes only and while all care is taken in its presentation Shead Property does not guarantee or warrant the accuracy, completeness or currency of the information.